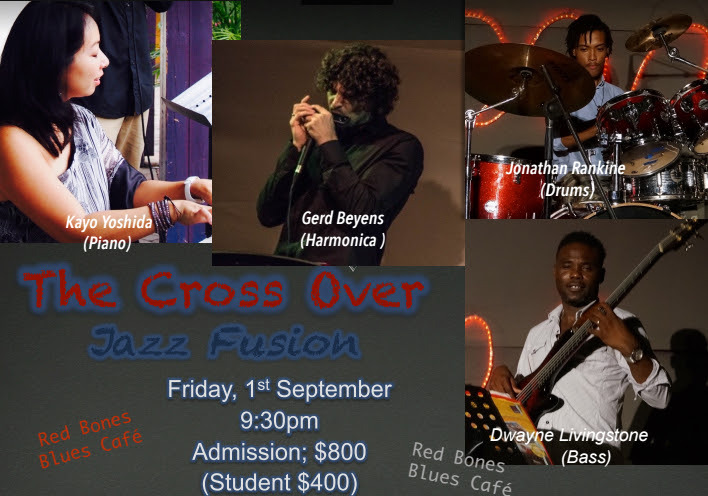 Jazz band The Cross Over brings a mixture of contemporary jazz, original compositions and arrangements of jazz standards and Japanese folk songs. Gerd Beyens (Chromatic Harmonica-Belgium) and Kayo Yoshida (Piano-Japan) are both lectures at the Edna Manley College. Dwayne Livingstone (Bass-Jamaica) is one of Jamaica’s most skilled bass players. Young talent Jonathan Rankine is currently pursuing a Bachelors in Music at the Edna Manley College.